Welcome to our complete hamster breed guide! Giving you an introduction to the various types of pet hamsters. And helping you to decide which one will be the best fit for your family! It is a rare person who looks at the palm-sized ball of fluff that is the pet hamster and doesn’t melt. They are just so cute! But not all small and cute hamster breeds are equally cuddly and friendly. And they all have slightly different care requirements too. 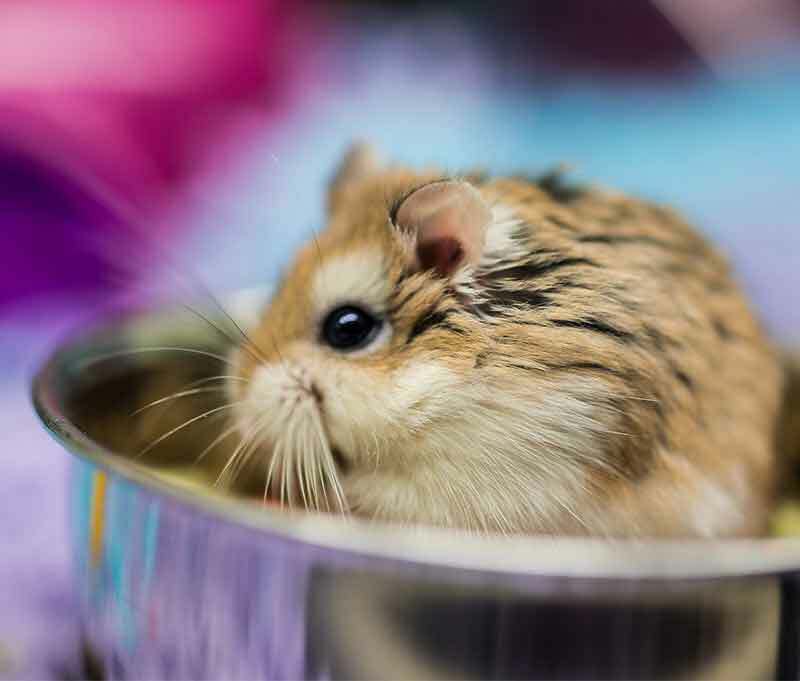 In this article, we will introduce you to the top five most popular pet hamsters on the hamster breeds list. 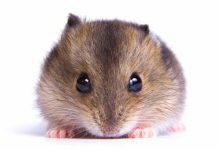 You will learn what each hamster breed needs for their care, how long each lives and their unique personality traits. Not to mention plenty of fun hamster facts along the way. By the time you are finished reading, you will have a better idea of the best breed to pick to be your personal perfect pet hamster. 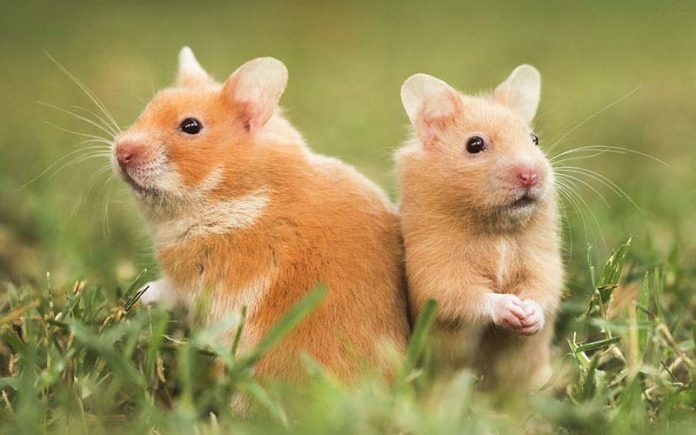 Did you know there are more than 20 distinct hamster breeds in the world today? 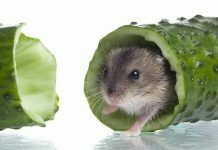 Although some different hamster breeds may look quite a bit alike, other breeds of hamsters can vary greatly in size, temperament, and care needs. 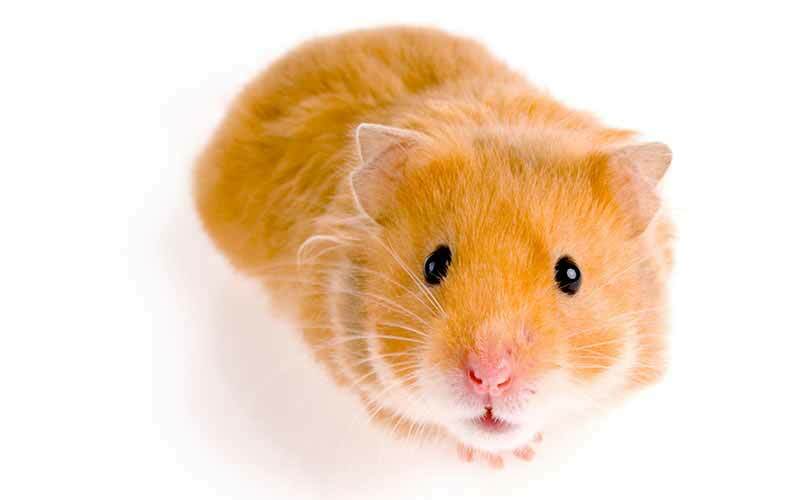 While various hamster breeds hail from around the globe, their common name was a gift from the Germans. You can find out all about where hamsters come from here. Speaking of which, here is a fun fact to marvel at: the hamster is able to carry half the amount of its own body weight in those same cheek pouches. That would be the equivalent of you stuffing several whole chickens into your cheeks! However, only about five hamster breeds are commonly kept as pets. Of these five breeds, the Syrian or Teddy Bear hamster is both the best known and the most popular. The Syrian hamster, Mesocricetus auratus, is also commonly called either the teddy bear hamster or the golden hamster. 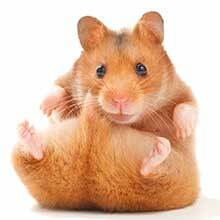 These are easily the most popular pet hamsters of all, to which they most likely owe their early introduction into the United States as laboratory animals in 1942. As it turns out, even those early scientists were not immune to the charms of hamsters as pets! It wasn’t too long before Syrian hamsters released from their lab duties were traveling home to meet the researchers’ spouses and children. Today, Syrian hamsters are widely considered to be the friendliest hamster breed and the best breed of hamster for families with children. They are also the most popular of the big hamster breeds. The main reason for this is because they almost never nip and are very easy to handle. Their sweet personalities will quickly convince you that the Syrian hamster is the nicest hamster breed of all. However, there are some important things to know about the Syrian hamster before you considering bringing one home to be a family pet. Syrian hamsters MUST be kept alone. If they are kept with another Syrian hamster, prepare for bloodshed! Syrian hamsters are the largest hamster breed. They can grow to be seven inches long! These hamsters’ relatively large size also means that Syrian hamsters need larger hamster wheels and bigger cages so they can move about and exercise. Syrian hamsters can be short haired or long haired. The teddy bear hamster is one of the long haired hamster breeds, and males will have longer coats than females. If you buy a Syrian hamster with long hair, you will need to groom him or clip the ends of his fur to prevent matting. Female Syrian hamsters tend to be more active than males. While Syrian hamsters are nocturnal, females are more apt to rouse themselves during the daytime than males. In terms of coloration, most but not all Syrian hamsters have golden coats. But some Syrian hamsters can also sport coats of chocolate brown, white, gray or even black. Syrian hamsters can live up to 4 years. Check out loads more Teddy Bear Hamster Facts here. If all of this sounds appealing, then maybe a Syrian hamster is the right hamster breed for you. But there are plenty more to choose from! There are two popular breeds of dwarf hamsters. Both are considered to be small hamster breeds. The first type is Phodopus campbelli, or the dwarf Campbell Russian hamster. Not surprisingly, the Russian dwarf hamster originally hails from Russia. This hamster has several names because it is named after where it is from and also after the person who first captured this hamster in the wild, a man named W.C. Campbell. For this reason, it is sometimes also called the Campbell’s dwarf hamster. These hamsters are mini compared to their large Syrian cousins – they won’t ever grow more than four inches long. They will live about two years and can be happy living with a same-gender adult or in a group, so long as they lived in a group when they were a baby hamster. Otherwise, it is best to keep an adult dwarf Campbell Russian hamster by itself. There are a few important facts about the Campbell’s dwarf hamster you should know. They are more high-strung than other hamster breeds. This hamster breed is known to nip when startled or frightened. They are still sweet natured, but you will need to supervise any interactions between your Campbell’s dwarf hamster and young children. Because of their small size and (apparently) overall deliciousness, these hamsters evolved to live in underground burrows and become more active at night when their natural predators were snoozing. However, sometimes a captive dwarf Campbell Russian hamster will wake for a bit during the day. You will need to take care when choosing a habitat. These teensy hamsters can slip between wider cage bars, or worse, get stuck. So be sure you choose a habitat with suitably close-set bars for your hamster’s safety. 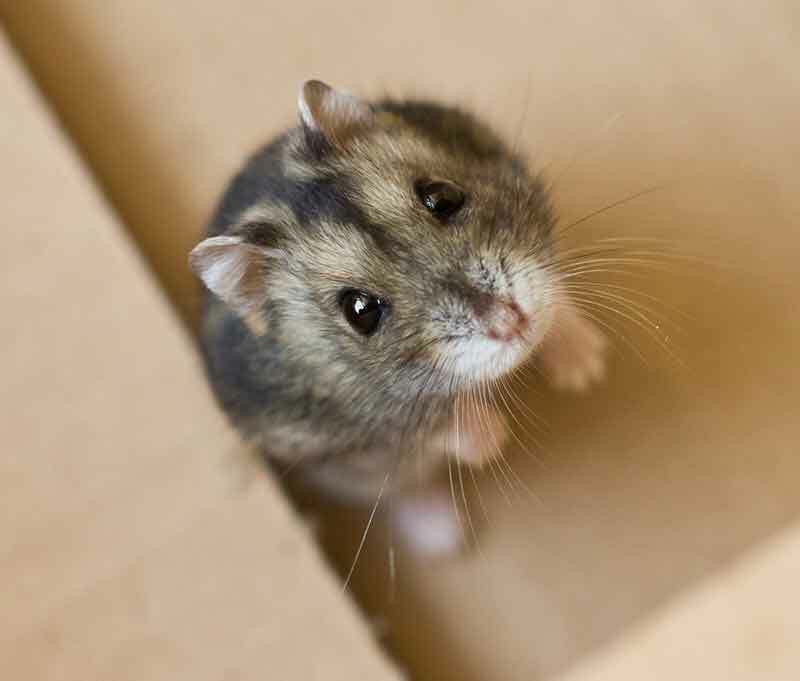 The Campbell’s dwarf hamster’s natural coat color is a grey-brown coloration on the back that is darkest along the spine and a white under-belly. But today’s captive-bred hamsters may display a surprising range of coloration due to the influence of breeders. At one time, biologists thought that the dwarf winter white Russian hamster, or Phodopus sungorus, was a sub-species of the dwarf Campbell Russian hamster. But today, geneticists have worked out that the two hamster breeds are sufficiently different for this hamster to deserve its own separate classification as a dwarf Winter White Russian hamster. Like its counterpart, the dwarf Winter White Russian hamster also has several names, including the Djungarian hamster (after a region in Mongolia where it lives) and the Siberian hamster (after a region in Russia where it lives). However, this doesn’t prevent the two breeds from getting easily confused. After all, they are both dwarf hamster breeds, they both hail from the same general region in northern Asia, they both have the same natural coloration and nocturnal habits, and they are both very petite and fluffy and cute! It is only if you look very closely that you will observe the more stout and compact configuration of the Winter White dwarf hamster and the more sleek and mouse-like facial features of the Campbell’s dwarf hamster. 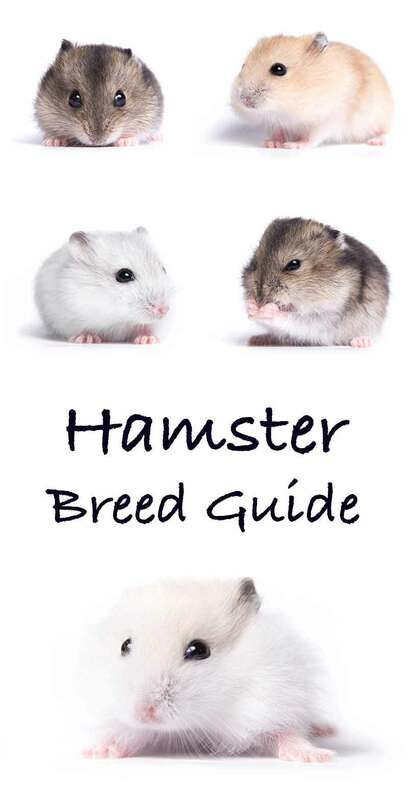 However, if you don’t see this, don’t worry – sometimes even professional breeders still get the two hamster breeds confused! 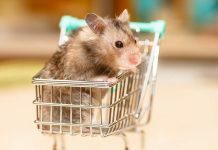 Right now, it is still more common to see a Campbell’s dwarf hamster in a pet shop than a Winter White dwarf hamster, which is one of the more rare hamster breeds, but that, too, is starting to change. Here are a few handy facts to know about the dwarf Winter White hamster. The safest habitat is an aquarium. These tiny little hamsters rarely grow more than three inches long. Because they are so small and petite in body size, a habitat with cage bars is not advisable for safety. A glass or plastic aquarium is a much safer choice. These hamsters love to work out. If you need motivation to get in shape, your new Winter White dwarf hamster can help you. They love to exercise and will absolutely need a running wheel and several climbing areas in their habitat. As one of the nicest breed of hamster, they will also happily welcome a workout partner/cage-mate of their own kind. If you are allergic to animal fur, you may not want to pick this hamster. More allergies have been reported by dwarf Winter White hamster owners than by owners of any other hamster breed. They are mellow and sweet. If visions of a teensy furball sitting in your palm as you pet it sends you into cuteness overload, this is definitely the hamster for you! They love to be held and are easy to tame. The Winter White dwarf hamster’s coat actually isn’t pure white. It comes in three colorations: pearl, sapphire and pearl-sapphire. 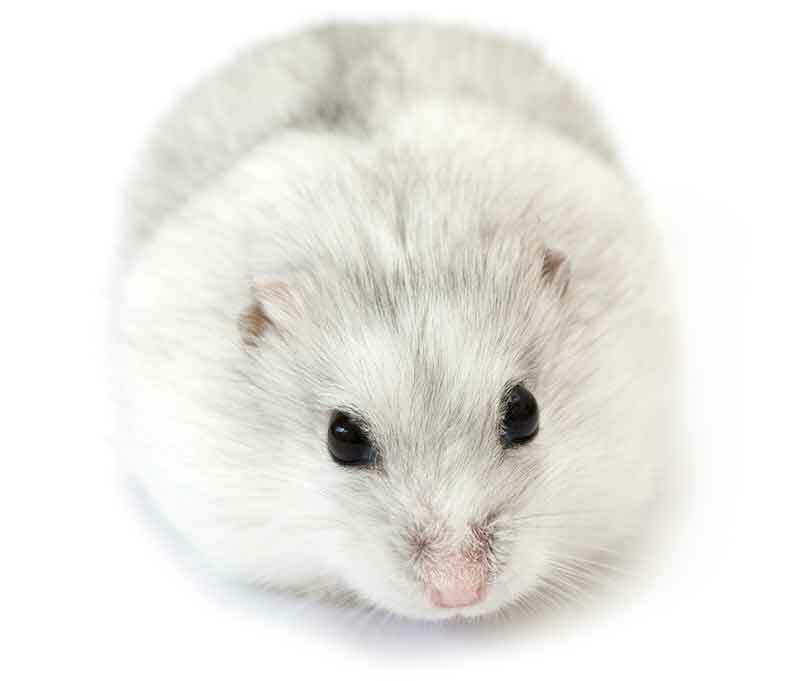 The only time a Winter White dwarf hamster will turn fully white is if it is exposed to true winter conditions (this is not recommended in captivity). The Winter White Dwarf hamster’s average lifespan is about two years. Phodopus roborovski, or the Roborovski hamster, is both the smallest hamster breed and undoubtedly the fastest. These incredibly petite dwarf hamsters grow to just 2 and a half inches long. Yet some have been clocked by their owners running more than 100 miles (about four marathon’s worth of distance) on their wheels in a single night! Due to its incredibly tiny size, the Robo hamster is considered by many to be the cutest hamster breed of all. Here are some helpful facts about the Robo hamster. You won’t be able to handle them much. The reason for this is not because they can’t be tamed, but because they are really difficult to hold onto! The instinct of any Roborovski dwarf hamster, when restrained, is to escape – and they are very good at it. So unless you want to spend all your time looking for your pint-sized pet in closets and under furniture, you will probably do best to leave your hamster in its habitat. They outlive other hamster breeds. Except for perhaps the occasional Syrian hamster, the Robo dwarf hamster wins the grand prize for longest lifespan at four years and counting. They are very social. So long as they lived in groups as a youngster, the Robo hamster will do well with a same-gender cage mate or even a group of Robo hamsters. Roborovski dwarf hamsters have lovely sandy-brown coats with white bellies, which just adds to their cuteness. The Chinese hamster, or Cricetulus griseus, is sometimes also called the striped hamster because of the darker stripe running down the spine. Size-wise, they can grow as long as four inches. Like the Robo hamster, the Chinese hamster is unlikely to be happy to be handled for any period of time. Choosing instead to run as quickly as he can in the direction of his enclosure! To some, the Chinese hamster looks more like a mouse than a hamster because of its long, lean body and mouse-like facial features. 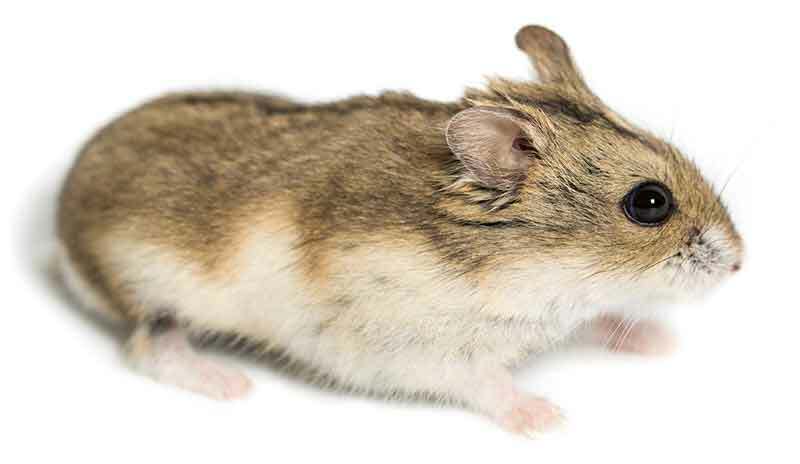 Here are some interesting facts about the Chinese hamster. They are best housed alone. While this hamster is timid and docile around people, they can get more aggressive when around other Chinese hamsters. They need lots of toys and space. A bored Chinese hamster can quickly turn into a grumpy, aggressive, nip-happy Chinese hamster. They love to play and will need a large habitat with lots of toys. Digging is another big favorite activity, and they will love to hide in tunnels and burrow under their bedding. They aren’t suitable pets for young children. The Chinese hamster is fragile, agile and quick, so all interactions between this hamster breed and young children must be supervised. An aquarium is the best cage choice. Cages with bars may look like a challenge to these petite and flexible hamsters, who are at risk of getting caught between the bars. Chinese hamsters can live as long as three years. Now that you have learned about the five most popular hamster breeds, you can make your choice about which one is the best pet for your situation and family. But we don’t expect it to be easy. After all, they are all hamsters, and as such, their beguiling cuteness transcends any breed differences! And so we wish you the best of luck in narrowing your choice down to a single breed, and we’d love to hear about your new pet hamster in the comments section here! Foran, J., “Caring for Your Hamster,” Weigl Publishers, 2003. Banks, R.E., DVM, “Exotic Small Mammal Care and Husbandry,” Wiley Online Library, 2016. Stern, L., “Super weird hamster facts that you may not know about your cuddly pet,” Mashable, 2016. Bond, C.R., “The Golden Hamster (Cricetus Auratus) Care, Breeding and Growth,” Physiological and Biochemical Journal, 1945. Next articleCan Guinea Pigs Run In Balls? You say Syrians don’t nip much… some do not and are so gentle and loving but others – I’ve had chunks taken out of my fingers by friends Syrians (as did they) and a lady I was speaking to recently for advice (she’s owned at least 8 hamsters in her adult life) has had numerous Syrian biters, one of which bit her finger so hard she had to have stitches. I have a Syrian and I was lucky enough to get the nicest hamster I have ever seen he has bitten only once in the time I have had him 2.5 years and that was bc my little sister picked him up while he was sound asleep. I’m thinking I want a female Dwraf WInter White Russian hamster and name her hazel or avery. I went to 6 pet stores and was bitten a total of 9 times by “Winter White’s” AKA the pitbullshark of the hamster world. I have owned 2 that were nicknamed “Jaws” and “Cujo”. Finally went with a nice normal Syrian named “Fatty Patty” and she is the sweetest little thing. Was I just unlucky with the winter whites? My niece really wants one but as I said, I had no luck with these fluffy little piranhas!